This book provides an overview on the particular development steps of gas insulated high-voltage switchgear, and is based on the information given with the editor’s tutorial. The theory is kept low only as much as it is needed to understand gas insulated technology, with the main focus of the book being on delivering practical application knowledge. It discusses some introductory and advanced aspects in the meaning of applications. 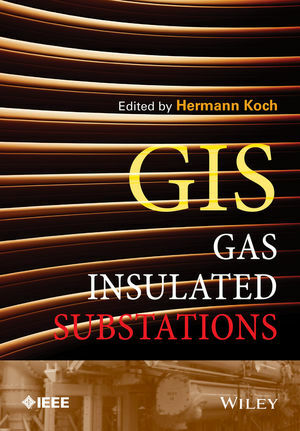 The start of the book presents the theory of Gas Insulated Technology, and outlines reliability, design, safety, grounding and bonding, and factors for choosing GIS. The third chapter presents the technology, covering the following in detail: manufacturing, specification, instrument transformers, Gas Insulated Bus, and the assembly process. Next, the book goes into control and monitoring, which covers local control cabinet, bay controller, control schemes, and digital communication. Testing is explained in the middle of the book before installation and energization. Importantly, operation and maintenance is discussed. This chapter includes information on repair, extensions, retrofit or upgrade, and overloading. Finally applications are covered along with concepts of layout, typical layouts, mixed technology substations, and then other topics such as life cycle assessment, environmental impact, and project management. Hermann Koch received his academic education at Technical University Darmstadt and New Jersey Institute of Technology in Newark, NJ from in 1986 in Electrical Engineering. His research work in the field of high voltages was concluded in 1990 with his doctoral thesis on partial discharge measurements for non-destructive testing. In 1991 he started his business career with Siemens in Erlangen Germany at the headquarters of the power transmission division. In several responsibilities he was engaged in gas insulated technologies for HV circuit breaker, gas-insulated substations and transmission lines. Responsible for technical support in sales, development of gas-mixture technologies like GIL, business development for GIS and GIL and for coordination of Siemens standardization activities on Energy Transmission Division. Currently he is Principle Expert of Standardization and gas-insulated high voltage system in Energy Transmission of Siemens. He is IEEE Fellow and Chairman of IEEE PES Substations Committee Working Group of the GIS Book. In IEC he is Secretary of SC 17C High Voltage Switchgear Assemblies. In CIGRE he is member of the Strategic Advisory Group of SC B3 Substations. He has published 150 technical papers and holds 31 patents in the field of gas insulated technology.